In a wealthy province like Alberta, high-value property ownership is on the rise – this brings along realities such as maintenance costs and insurance. As with most products, you might shop for the most affordable insurance premium or the policy with the least features. It makes sense, but it should not apply to luxury vehicle insurance. Learn how to best invest your dollar with ARC’s five essential tips below. When they are damaged or in need of repair, luxury vehicles require precision treatment that can take longer than your average oil change. Don’t spend weeks without a vehicle or pay out of pocket, bespoke insurance policies can help extend the length and lower the cost of a rental replacement. Depending the insurer, you and your luxury vehicle may qualify for special discounts. Offered to clients who are expected to be less at risk of accident, damage or other claims – standards range from investing in high fuel economy to having more vehicles than drivers or even being part of an automobile club. Often lower tier vehicle insurance policies allow for repairs to be completed with aftermarket mechanical and autobody parts. While these are suitable for most, off-brand parts tend to stand out when the vehicle around it is built to luxury standards. Luxury vehicle insurance almost always covers the exclusive use of OEM parts (Original Equipment Manufacturer). Many garages or auto body shops advertise being able to fix anything, while others make a point of offering specialization to certain makes and models. Both are fine, but luxury vehicle owners tend to opt for techs that have the most experience with their brand. Luxury vehicle insurance allows for the client to choose their preferred point of service. Most important of all, a luxury vehicle policy provides more comprehensive coverage than your average insurance. It may require a higher deductible or higher payments, but it will make all the difference if the worst happens and you need to file a claim. Better coverage can also mean a full replacement without depreciation that is usually applied to lesser policies. 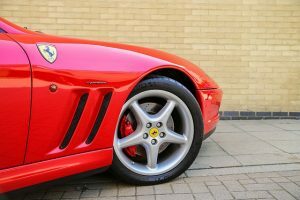 The five tips above are essential, but they are only a sampling of what luxury vehicle insurance can provide. For full details and answer to any of your questions, contact ARC Insurance Brokers today!